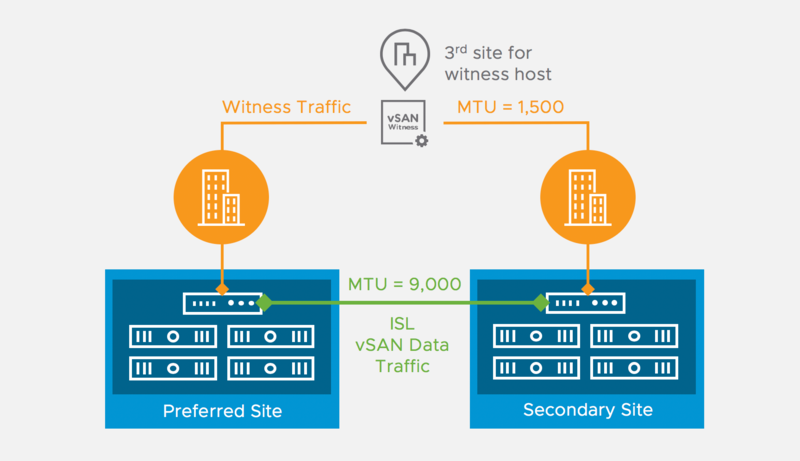 In continuation to my blog Deploying a witness appliance in vSAN let’s go ahead and see how to enable witness traffic in the environment. This feature allows flexibility to distinguish node to node traffic & node to witness traffic. In witness host, you need not to tag witness traffic. In here, vmk1 is tagged for vsan traffic and on the data nodes side vmk1 has to be tagged for witness traffic. There is no option in vsphere webclient/vsphere client to enable witness traffic on the vmkernel adapter. Note: You can use witness tag on management vmkernel also. If you do not wish to use different subnet for witness traffic. Since vSAN 6.7U1 mixed MTU support has been added in vSAN stretched clusters and 2 Node ROBO clusters. Let us take an example if vmk1 is being used for witness traffic and vmk2 is being used for vsan network on the data nodes. So, between data sites vmk2 can be used for vsan traffic with MTU size of 9000 and between data site to witness site vmk1 can be used for witness traffic with MTU 1500. You can also tag management vmkernel vmk0 for witness between data sites to witness site. This is also a supported configuration. Have a look at https://blogs.vmware.com/virtualblocks/ for more understanding.